The beauty of open-architecture PLC (programmable logic controller)-based press controls is not lost on Mark Turk, a process engineer with Tier One automotive supplier Dura Automotive Systems. Dura and its sister company Global Automotive Systems (GAS) group operates seven North American plants, including metalforming and assembly facilities in Monterrey, Mexico, and Milan, MI. 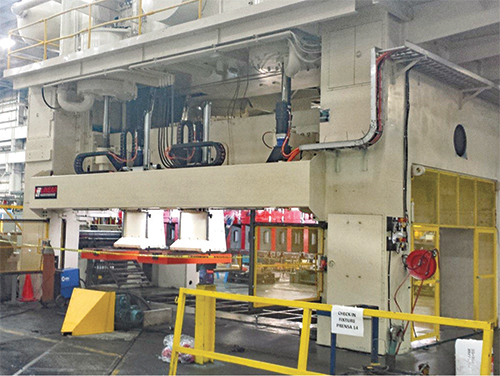 Both of these facilities have welcomed, in recent years, transfer-press upgrades centered on press-control. And, both retrofit projects feature PLC-based setups configured with off-the-shelf Allen-Bradley processors and I/O modules; software for signature analysis; web-based fault-history reporting; and more. “These controls are easily reconfigurable and customized to match our exact needs. For example, I can go in and reprogram the lower limit on press speed, to help with die tryout and setup, a task that becomes complex and lengthy using a proprietary control. 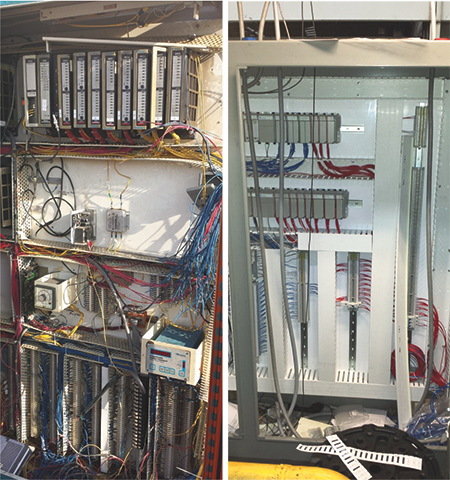 These photos compare the wiring complexity of the old control cabinet (left) installed on the Verson press in Monterrey, and the new press control, which features off-the-shelf Allen-Bradley processors and I/O modules. Among those benefits is the use of Helm’s FirstMate WebVIew browser-based production-reporting software, generating reports on fault history and press-cell up- and downtime. Taking data from through-the-stroke tonnage-monitoring (Helm’s Loadgard package) sensors and Helm’s Mariner signature-analysis software, WebView generates real-time graphical waveforms for each production run and delivers them to remote PCs via Ethernet. The Loadgard setup integrates force measurement with crank angle, providing detailed monitoring throughout each stroke. Users can set upper and lower limits and establish alarm setpoints, or even initiate press shutdown if necessary at any time during the machine cycle. 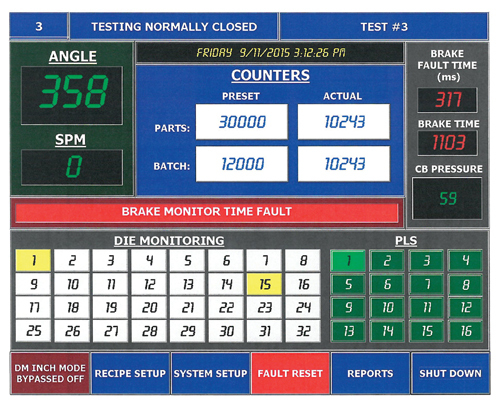 With the PLC-based control, human-machine interface (HMI) screens are completely customizable. 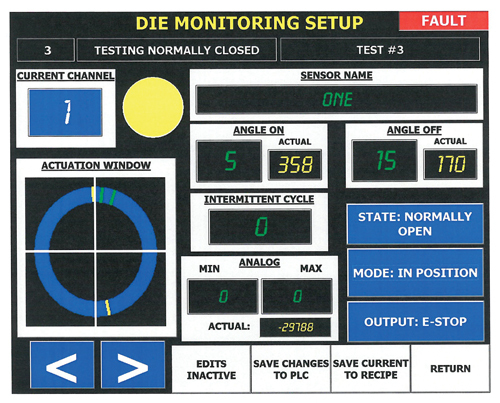 Shown are the main screen (left) and the die-monitoring setup screen. Dura and GAS plants manufacture a host of automotive products, including structural body products, seating systems and closure hinges. In addition, the Milan plant performs some rather dramatic deep-draw operations, including forming a door threshold 3-ft. long by 20-in. wide, with a 10-in.-deep cavity, drawn in one hit. That’s the type of part Turk refers to when explaining how through-stroke tonnage monitoring and signature analysis can pay off. On the press in Mexico, the control features 48 inputs for sensors. “If you run out of inputs,” says Turk, “you have to connect the sensors in series. We do not want to do that because it makes it harder to trace problems if a sensor fault occurs. So, we want to isolate the sensors, especially on a press that large, that includes automation. We have cam drivers on that press, and we want to monitor whether they are in or out, and whether a part is sitting in the die correctly, on each end. That means we can have six sensors in one station—cam-in and cam-out on each end, and part-in-place on each end. An added safety feature: use of programmable safety relays. This, according to Helm, enables control of multiple light-curtain functions including barrier guarding and e-stops. Lastly, as temperature in the plant can impact press performance and reliability, Turk equipped the control setup to monitor operating temperature and ensure that bearing points remain adequately lubricated. See also: Blow Press Limited, Helm Instrument Co., Inc.